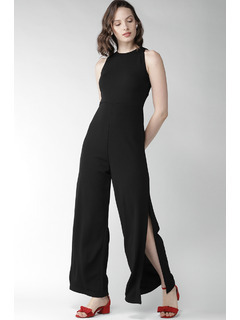 Swooning over this elegant one shoulder jumpsuit! This on-trend piece is perfect for those events you want to get dressed up for, but dont feel like wearing a dress! Accessorize with: A pair of pumps and a sling bag will complete this stunning look! Green polyester crepe with lycra content jumpsuit. Side zipper for fastening and ease. Gathers detailing on the front for style. Has pockets on both the sides.